An Island Tides Wildlife Viewing & Marine tour is the perfect way to spend a few days, or longer, exploring the natural wonders of Vancouver Island, BC. 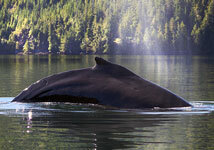 Our West coast Vancouver Island marine tours include whale watching for Humpback Whales, Grey Whales and Killer Whales (Orca whales), Sea otter’s and up-close encounters with bald eagles, seals, sea lions and other marine mammals and the many different species of sea birds that inhabit the area, and trips to historic Friendly Cove (Yuquot) and Nootka Light house. Adventure on Land, Sea or River Raft! Our BC Wildlife Viewing Adventure Tours can combine marine tours with land based wildlife viewing tours, or a raft trip down a gently flowing west coast river through spectacular old growth forests where you can see Black Bears fishing for salmon, Bald Eagles, and maybe even Roosevelt Elk, Black tail deer or possibly an elusive cougar or a wolf. At Island Tides Outdoor Lodge we offer our guests a very personalized outdoor adventure experience with all of our outdoor adventure tours accommodating only smaller groups of two, three or four people and as our lodge only accommodates up to six people at a time you will enjoy a relaxed quiet atmosphere where you will never get lost in the crowd. 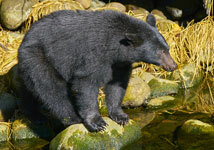 Through the spring months of May and June Black Bears can often be seen feeding along the shoreline of Esperanza and Tahsis inlets, turning over rocks in search of small eels and crabs or feeding on the new spring grass growing in the many creek and river estuaries in the area. From the middle of September through the month of October is a great time to view Black Bears on Vancouver Island as the bears migrate down to local river’s to fish for spawning salmon, and one of the best bear viewing stands in BC is the deck of our Island Tides Outdoor Lodge in Zeballos on the West Coast of Vancouver Island, BC. As salmon spawn in the river in front of our lodge in late September through October bears can often be seen fishing in the river. Guests can get out their cameras, enjoy a cup of coffee or have a delicious lunch with a glass of wine and watch and photograph the bears fishing in the river from the safety and comfort of our lodge. The waters surrounding Nootka Island, on the West coast of Vancouver Island, BC are a summer home to several species of whales including Humpback Whales, Grey whales and Killer Whales, some of the best whale watching opportunities are in September and October when the giant Humpback Whales come into Esperanza Inlet and Tahsis inlets to feed and are often only a few minutes boat ride from the dock. Just imagine drifting in the boat on a quiet morning and the only sound you hear is the puff of feeding Humpback Whales exhaling as they surface a short distance away. 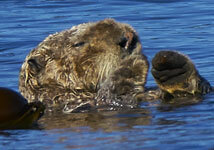 We invite you to visit the sea otters of Esperanza! Esperanza Inlet, on the West Coast of Vancouver Island, BC, is home to hundreds of sea otters. 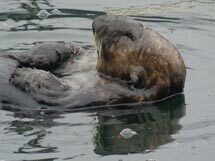 Here the sea otters are frequently seen in large family groups called rafts or in smaller family units. It is always a pleasure to watch these playful animals as they break open clams or mussel’s on their chest using a rock or just lazing about, floating on their backs soaking up the sun. Located a scenic 1 hour boat ride from our dock was inhabited by the Nootka people for more than 4000 years and is considered to be The birthplace of British Columbia, as it was the site of the first contact between Europeans and First Nations people in British Columbia and where Captain Cook first landed in British Columbia. Still rich in first nations culture and local history. Grizzly Bears / Black Bear / Whales/ Sea Otters/ Breathtaking Scenery. 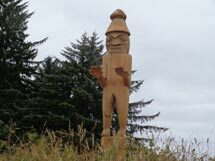 Marine & Land Tours: Historic Friendly Cove, (Yuquot) Nootka Light House, First Nations Culture. 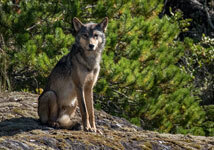 Contact us for more information on putting together your Vancouver Island outdoor adventure. We are able to customize all inclusive BC adventure tours from two to six days in length with fully guided tours, first class accommodation, all meals and non-alcoholic beverages, airport pick up and drop-offs. It's all here just waiting for you on Vancouver Island, British Columbia, Canada!